Sergei Tcherepnin (b. 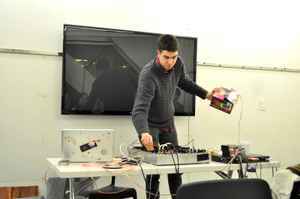 1981) is an American contemporary sound-art/installation artist who builds interactive audio installations and composes multiple-channel pieces that are actualized through sculptural forms, existing simultaneously as speakers and instruments. Sergei is the younger brother of Stefan Tcherepnin and composer in fourth generation, continuing the family heritage of his great-grandfather Nicholas, grandfather Alexander Tcherepnin and father Ivan Tcherepnin. Sergei received a BFA from Bard College and MFA from the Milton Avery Graduate School of the Arts in 2011. Tcherepnin presented his works in New York, Paris, Zurich, Tokyo, London, Brétigny-sur-Orge and participated in the 55th Venice Biennale, the 30th São Paulo Biennial, MoMA's first major exhibition of sound art Soundings: A Contemporary Score in 2013, and the 2014 Biennial at the Whitney Museum Of American Art. His solo and collaborative installations had been exhibited at the Guggenheim Museum, New York, NY and The Art Institute of Chicago. In 2014, Sergei Tcherepnin received a Villa Romana Fellowship in Florence.